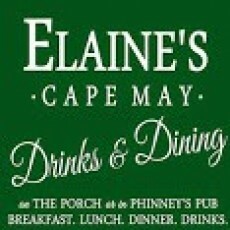 Welcome to Elaine's, a boutique hotel, gourmet restaurant, Victorian pub and amazing dinner theater located in the heart of downtown Cape May, NJ. Our beautifully restored Victorian mansion features every modern amenity you could ever need and is just minutes away from our beautiful beaches, shopping, restaurants, and everything else our seaside town has to offer. With a wide variety of services, amenities, and events, we have something for everyone in your group including live music and food & drink specials outside on The Porch, Walking Ghost Tours around Historic Cape May, a wrap around veranda complete with rocking chairs, and an exciting list of special event weekends and seasonal soirees. Our Famous Dinner Theater was voted one of the top five in the United States and is truly a 'must-do' experience while visiting here in Cape May. Fun, Comedy, Silly Adventure with Great Food &	Drinks! Elaine's Famous Dinner Theater......Our Dinner Theater package includes a full course dinner and show. You will choose from a wonderful selection of sumptuous entrees and enjoy an unforgettable live show. Voted one of the top 5 dinner theaters in the country by Food Network! Elaine's Haunted Mansion Restaurant......At the Haunted Mansion Restaurant... you can expect anything! Funny illusions, interactive special effects, guest ghosts, music that's 'ta die for, living dead stand up comedy plus fine dining and spirits (no pun intended). Elaine's Walking Ghost Tours......Join us for a "spirited" journey through the Victorian Streets of Cape May, as we explore the eerie history of this charming seaside resort. Our one hour outside walking tour takes an entertaining and unnerving look at some of the most haunted sites in Cape May.